New York and London: Routledge, 2019. 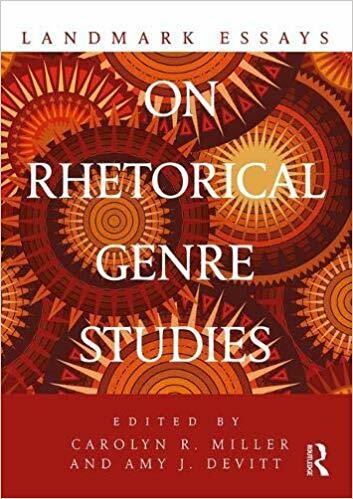 Landmark Essays on Rhetorical Genre Studies gathers major works that have contributed to the recent rhetorical reconceptualization of genre. A lively and complex field developed over the past 30 years, Rhetorical Genre Studies is central to many current research and teaching agendas. This collection, which is organized both thematically and chronologically, explores genre research across a range of disciplinary interests but with a specific focus on rhetoric and composition. With introductions by the co-editors to frame and extend each section, this volume helps readers understand and contextualize both the foundations of the field and the central themes and insights that have emerged. It will be of particular interest to students and scholars working on topics related to composition, rhetoric, professional and technical writing, and applied linguistics. "In one volume we find RGS’s necessary historical contexts, the early innovations, and the pioneering applications to critique and pedagogy. With judicious curation and lucid framing, Miller and Devitt have given the field what it has long needed: ready access to the deep clear spring of its foundational texts – endlessly renewing, endlessly instructive." "With its compilation of foundational historical and theoretical perspectives on genre and inclusion of richly varied, groundbreaking studies reconceptualizing genre, this book is an invaluable resource for scholars. Key features include critical attention to genre ideologies and innovative genre pedagogies. The book is truly a landmark, identifying and locating essential readings on RGS." Now available through Amazon, independently published and reissued in both eBook and paperback form. See link below. Based in current genre theory, this rhetoric helps students make more informed rhetorical choices and participate more effectively as writers within academic, workplace and public contexts. This . . . text teaches students how to use genres to assess, understand, and write within different “scenes” or writing situations. Discussions of writing for academic contexts cover writing analysis, argument, and research-based genres. Public and workplace writing is illustrated though discussions of other genres—letters, résumés, proposals, reports. Through specific guided questions, students identify and analyze new genres and use genre knowledge to read and write their way into different situations both in and beyond the college composition course. Carbondale IL: Southern Illinois University Press, 2004. Reissued in paperback 2006. 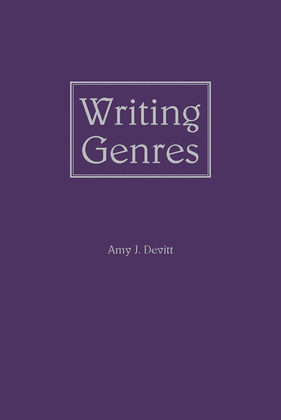 In Writing Genres, Amy J. Devitt examines genre from rhetorical, social, linguistic, professional, and historical perspectives and explores genre's educational uses, making this volume the most comprehensive view of genre theory today. Writing Genres does not limit itself to literary genres or to ideas of genres as formal conventions but additionally provides a theoretical definition of genre as rhetorical, dynamic, and flexible, which allows scholars to examine the role of genres in academic, professional, and social communities. 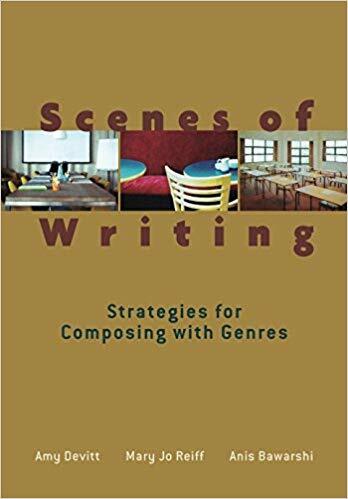 Writing Genres demonstrates how genres function within their communities rhetorically and socially, how they develop out of their contexts historically, how genres relate to other types of norms and standards in language, and how genres nonetheless enable creativity. Devitt also advocates a critical genre pedagogy based on these ideas and provides a rationale for first-year writing classes grounded in teaching antecedent genres. Diffusion in the Case of Scotland 1520-1659 Cambridge: Cambridge University Press, 1989. Reissued in paperback 2006. Professor Devitt offers a new view of the linguistic process of standardization, the movement of specific language features towards uniformity. Drawing on theoretical arguments and empirical data, she examines the way in which linguistic conformity develops out of variation, and the textual and social factors that influence this process. 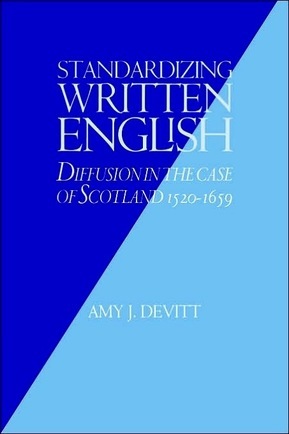 After defining and clarifying the general theoretical issues involved, the author takes as a specific case study the standardization of written English in Scotland in the sixteenth and seventeenth centuries, and shows that standardization is a gradual process, that it occurs at significantly different rates and times in different genres, that it encompasses periods of great variation, and that it occurs concurrently with sociopolitical shifts. The interrelationship of linguistic features, genres, and social pressures shape the nature and direction of standardization.